Pebble announced another new smartwatch at MWC 2015 today – the Pebble Time Steel – but with the Apple Watch set to come to market next month, there’s about to be another huge competitor on the market. 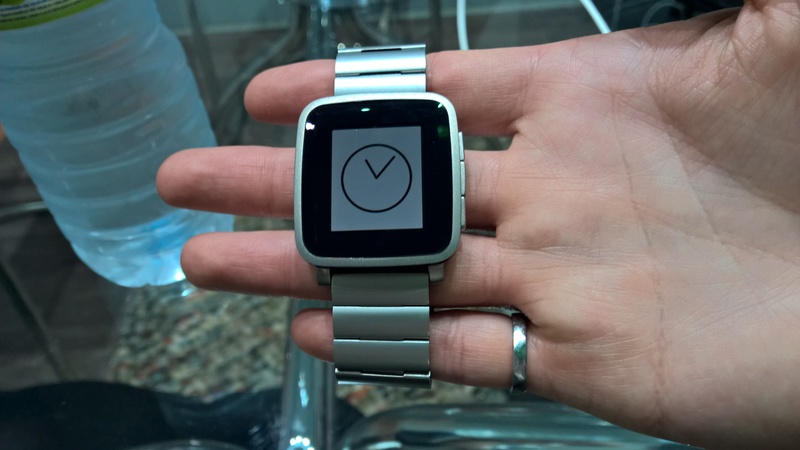 Nonetheless, Pebble’s CEO Eric Migicovsky told TNW that he’s not too concerned about the impending launch. Obviously Apple is coming into the space and they seem like they’re interested… It says iPhone, Mac, Watch [at the top of Apple’s website] so it’s going to be pretty exciting, but it’s a pretty different product. In some ways, it’s definitely lacking, in quite a few ways, but they’re going after a pretty different market segment. One of the ways that the two will be different is price. Apple hasn’t announced its final pricing yet, but it’s thought to be around $350 for the basic model Apple Watch, which could increase depending on your choice of strap or other accessories. Currently, the Time Steel can be reserved for $250, rising to $299 once the Kickstarter campaign ends. 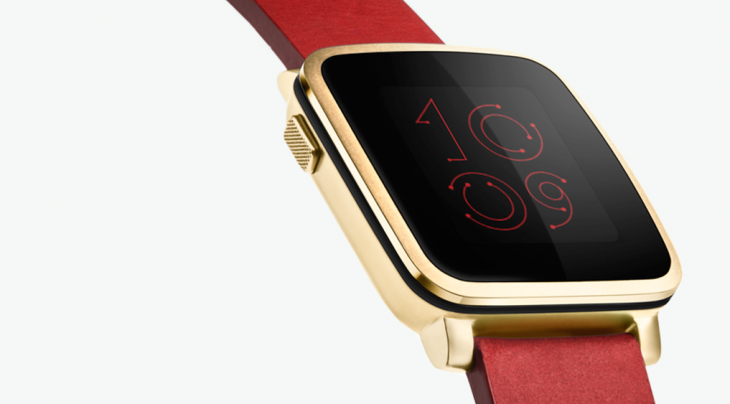 Another of the ways that the two company’s devices are different is that Pebble also unveiled its interchangeable watch straps that allow third-parties to add in additional sensors (and therefore functionality) to Pebble devices. This is a smart move from Pebble, not only does it make devices potentially upgradeable in future (or if a component fails), but it will also help grow Pebble’s pool of 26,000 developers that already build watch faces and other apps for the platform. What we’re excited about is the opportunity that hardware developers will have the same kind of renaissance of being able to hack on their Pebble. I don’t think it’s exactly an overlap [between hardware and software hackers]. A hardware hacker is probably more in the Arduino community than someone who’s building JSFs (JavaServer Faces) for Pebble, but I think there’s definitely some overlap. I think it’s more just complementary; people who write apps and beautiful watchfaces are interested in Pebble, people who like hardware are interested in Pebble and we want to get them all hacking on it. I won’t be happy until I see an Arduino wired up to talk directly to Pebble, that’d be cool… I don’t know exactly what it’d do but I know it’d do something awesome, maybe LEDs and making them do cool patterns. However, for now, Pebble is focused squarely on smartwatches, and has no plans for any other sort of wearable, according to Migicovsky. We’re focusing on the wrist right now, it’s a big opportunity for us because we know it well. The wrist can be a platform unto itself, it’s not just relegated to being an accessory to your mobile phones, and it can be the basis for a computing platform. Exactly what effect Apple’s launch will have on Pebble remains to be seen, but with a strong track record, wide-ranging developer support and ambitions to elevate smartwatches beyond mere companion devices, Pebble has a better chance than most in fending off the competition.